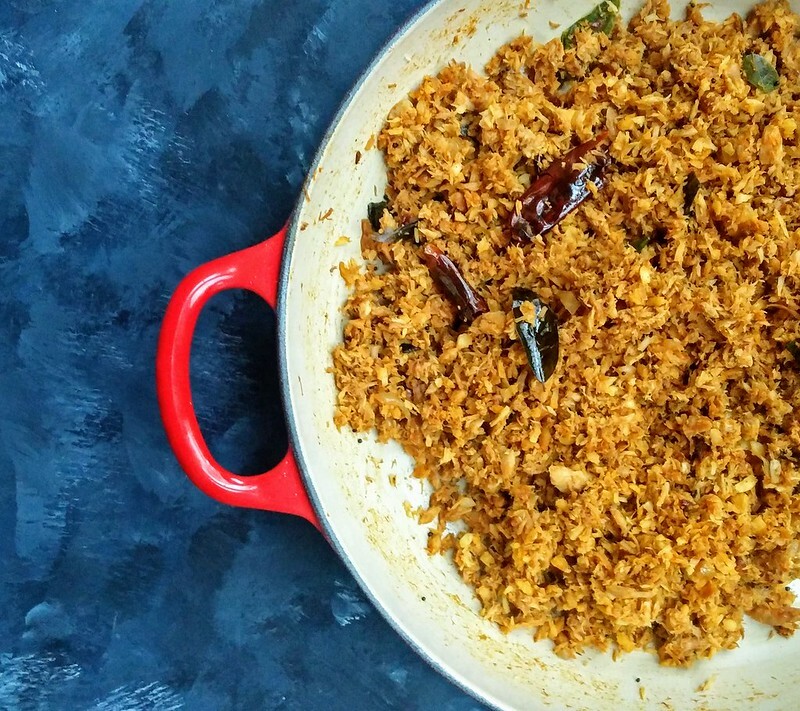 A staple in most of the Kerala households, a thoran is nothing but a vegtable of choice cooked with basic ingredients like turmeric and chilli and finished off wwith freshly grated coconut that takes this dish to its delicious level. Mostlly had as a side to rice. PS: Made in a Le Creuset shallow casserole. Heat oil in you frying pan and add the mustard seeds. Once they splutter add the red chillies and curry leaves, stir for a second and then throw in the shallots. As soon as the shallots become slightly brown, add the green chilli, grated ginger and garlic and continue to cook till it no longer tastes raw. Add all the masala powders and salt to taste and stir it all together and cook till no longer raw. Stir in the tuna and cook on medium heat for about 5 to 6 minutes. If it becomes too dry, mix in a spoon or two of water. Finally add the grated coconut and cook for a further 3 to 4 minutes, just to get the flavors in. Turn off the heat, close with a lid and keep aside for 5 minutes. Serve as a side to rice, roti or even as a sandwich filling (its great with mayo).